Sign In / Sign Up ? Before the fall, food was the way we expressed our obedience and trust in God. We obeyed God by eating from any tree except the tree of the knowledge of good and evil. My Mexican friend Alejandro is horrified at the way Americans eat food on the move. We’re so busy trying to be in control that many of us treat food as fuel. As a result we strip food of its identity as a gift, its “gift-ness.” It becomes mere utility. We disregard its rich variety and amazing tastes. Denying that food is a gift allows us commune, and express gratitude is written out of our schedules so we can get on with achieving our own goals. We’re too busy proving ourselves or managing our lives without God to stop and express our dependence. Food is meant to express our dependence on God, but we use food to express our independence from God. For my anorexic friend, food became a way of exercising control. In a scary world full of many things she couldn’t control, she could at least control what went in her mouth. But, as she herself put it, this practice quickly escalated and became out of control. Anorexia is for some a way to exercise self-sovereignty instead of trusting the sovereignty of God. Food became a means of salvation and deification now, just as it was in the garden of Eden. Satan tells Eve that she and Adam will become like God if they eat the forbidden fruit. Our concern for self-image is an attempt to be godlike. We want to be worshiped. We are concerned with our glory instead of living for God’s glory. We are controlled by the opinion of others instead of recognizing God as the glorious one whose opinion is the one that truly matters. Today we still take the fruit—or deny ourselves the cake—to become godlike, people with bodies others will worship and serve. The tragic irony is that Adam and Eve were already like God, having been made in his image. But we attempt to remake ourselves through food into a form that others will worship. For some food is aspirational. We use it to express the image or lifestyle to which we aspire. Organic and whole-food produce—these are the things that prove you’re enlightened and politically aware. Or maybe it’s steaks and burgers—they make you feel like a true man. Or maybe it’s pot roasts and home-baked apple pie like your grandmother made—they make you a traditional, all-American mom. Or maybe it’s cordon bleu and haute cuisine—they make you an urban and urbane sophisticate. Others manipulate food to prove themselves through their looks by obsessing about their calorie intake. We use or misuse food to form our identity instead of finding our identity in Christ. We use food to achieve identity instead of receiving it by grace. The first thing that happens when Adam and Eve eat the fruit is that they feel shame (Genesis 3:7). Still today our attempts at self- salvation through food lead to shame. They generate body-image problems. Slimming programs can offer a kind of points-based religion. Salvation comes through being accepted by others, and a beautiful body is the means by which we save ourselves. Food is rated, so your progress toward salvation can be scored. Your life is assessed when you stand on the scales. Weight loss equals righteousness; weight gain equals condemnation. 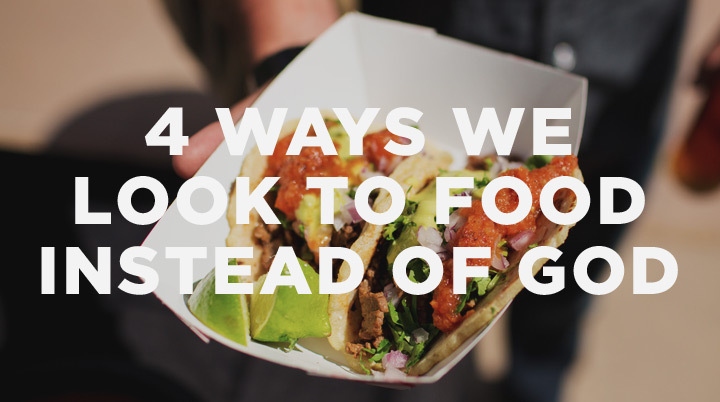 We often use food as an escape instead of finding refuge in God. We self-medicate with food. We become priests bringing offerings of chocolate to ourselves. We find comfort in sugar, salt, and fat instead of the living God. The result is ill-health and weight gain. Some people then try to manage this through dieting, bulimia, or anorexia. Life without God is an empty life, and we cannot fill that emptiness with food. We miss the opportunity to turn to God. We want to live by bread alone. We find true refuge in the comfort of God and true satisfaction in the goodness of God. Neither eating to live (food as fuel) nor living to eat (food as salvation) is right. We’re to eat to the glory of God and live to the glory of God. We're to gratefully receive food in all its wonderful variety as a gift from God as eating continues to express our dependence on him and our submission to his good reign. This cotent is adapted from A Meal with Jesus: Discovering Grace, Community, and Mission around the Table by Tim Chester copyright © 2011. Used by permission of Crossway Books, a publishing ministry of Good News Publishers, Wheaton, IL 60187.